Unknown11:57 AM 0 sweets for free! This is BIG newd for the Philippines! The intention is for prepaid non-internet users to experience mobile internet and get into the habit. - post on social media - Facebook, Twitter, Instagram etc. 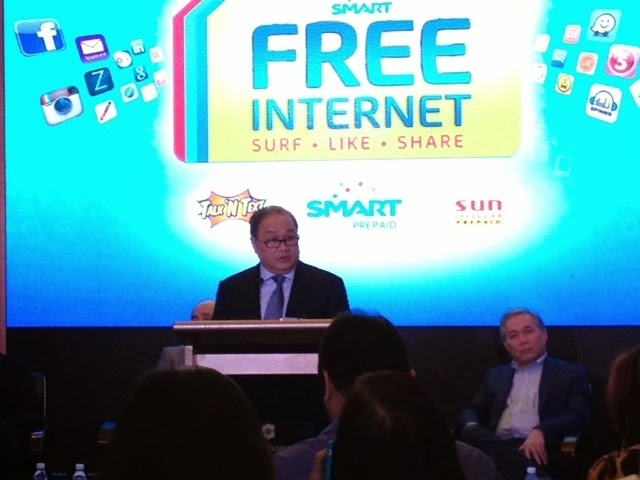 Smart assures users that they have the capacity to offer this service. To avail of the free mobile internet offer, Smart, Talk n Text and Sun Cellular subscribers must have an available airtime balance of at least one peso, or is subscribed to any load bucket or promo. Users must register each day by simply sending "FREE" to the number "9999". Registration is free. You will receive an SMS confirmation upon successful registration. Once registered, subscribers can enjoy free data volume package of up to 30mb per day. This is available for everyone and not intended for video streaming and downloads, messaging, VOIP and peer-to-peer uploads and downloads. Using this will incur regular charge. Because the intention is to make it available for everyone. The promo will run until November 30, 2014.